With Batch Text Replacer (formerly Batch Text Replacer), you have a powerful tool at hand to edit multiple text files simultaneously. The program contains a variety of powerful features to adjust the contents of text files as needed. For example, whole sections within a text can be replaced, inserted or removed. Furthermore, you can add or remove line breaks, change the encoding of text files using the integrated text converter and much more. All functions can be combined and saved as a template for reuse. The built-in backup function allows you to reverse the changes if necessary. By using the integrated file search of the program, files can be searched for certain keywords in advance, allowing you to narrow down the text files to be edited in a preselection (additionally to the separately usable filter). For example, replace, insert or remove rows, line breaks or text blocks etc. Restrict the use to certain areas through the use of flexible, nestable filters. 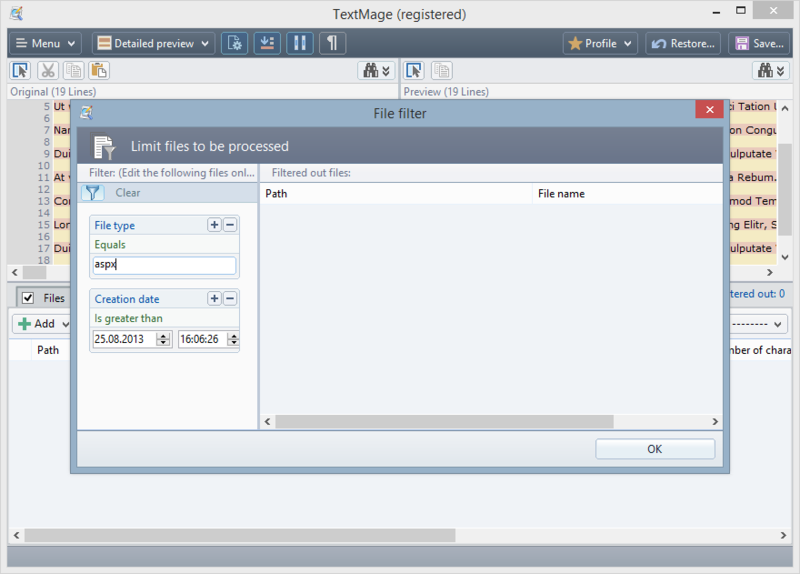 The batch processing solution contains many useful functions for flexibly editing multiple text files. For example, for searching and replacing text passages, you have several tools at your disposal; among others you can use a CSV file for this task. By being able to combine all functions together in any order, you can perform very complex text operations with Batch Text Replacer. The effect of the changes will be shown in the preview in real time. This allows an examination of the result in advance. Changed text sections can be highlighted in color for clarity. 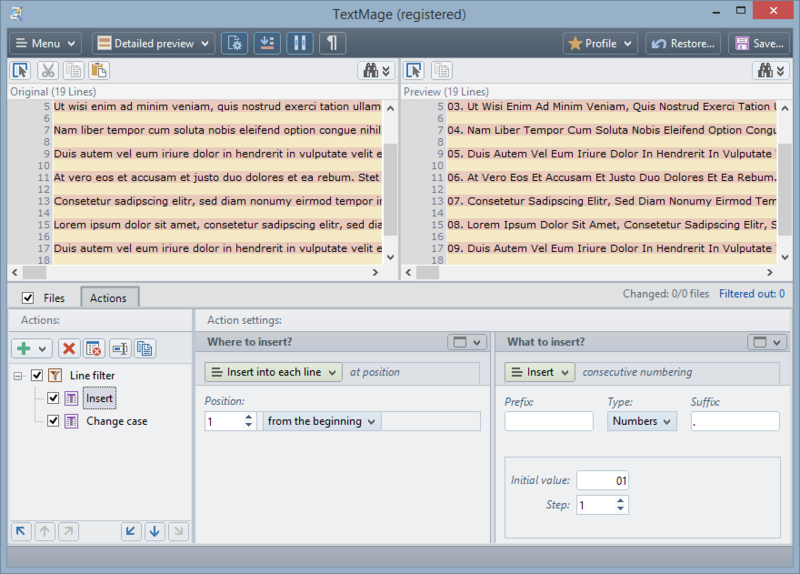 Batch Text Replacer contains many features and powerful filters for editing lines. 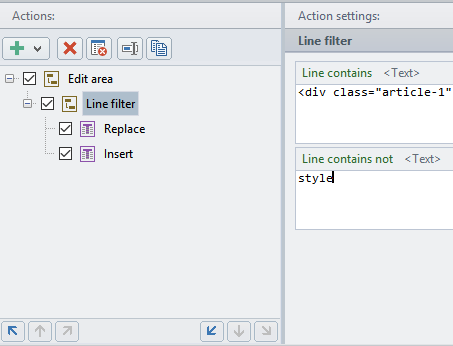 Using the line filter, lines may be excluded from editing or be exclusively processed. For example, you can remove all lines that begin with a pound sign or a slash in all text files added to edit. Furthermore, it is possible to move a defined range of lines or lines with specific properties to any position or to edit e.g., indent these lines exclusively. 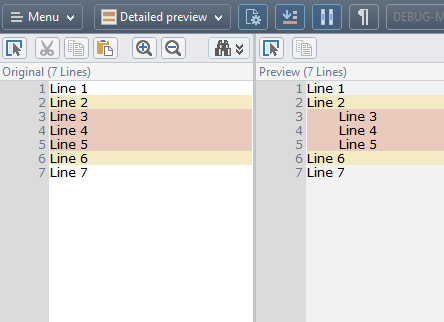 For advanced users, additional options for the flexible editing of lines are available through the use of variables and regular expressions. The use of variables allows, among other things, to store two groups of lines in individually named variables in order to insert these two variables combined at a certain location into the text. 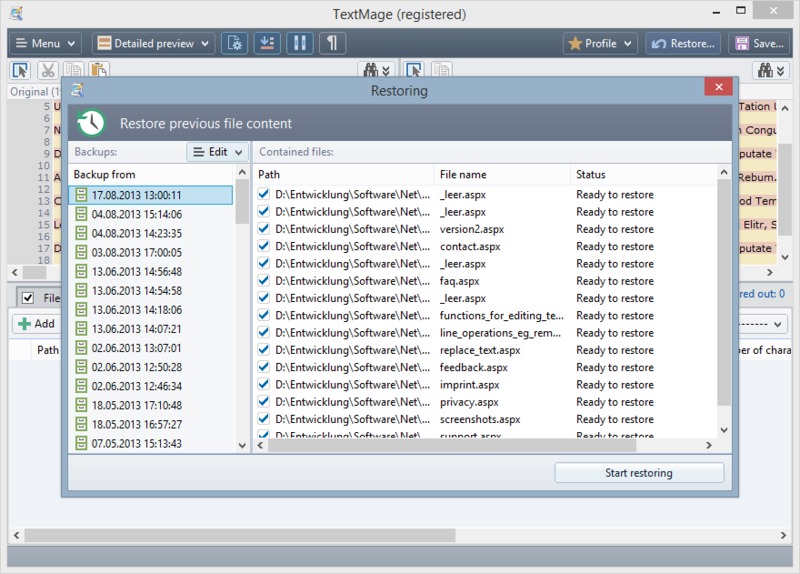 Batch Text Replacer includes multiple tools to restrict the text to be edited. The text area to be processed can be precisely defined by entering a start and end criterion. This is helpful, for example, in order to replace only the text between two HTML tags. You can use the "Repeat" option to process all subsequent areas that meet the specified criteria. Furthermore, it is possible to exclude files, text areas or lines with certain characteristics from the processing, such as lines that begin with a number or a certain term. Area limiter and filters can be nested across multiple levels.